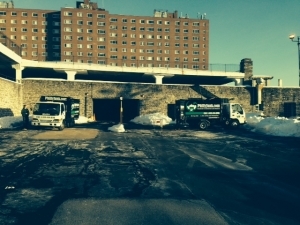 PhillyJunk removal crews begin arriving and setting up for another commercial building cleanout right after another snow fall. With a cleared parking lot the first of six various size junk removal trucks arrive with PhillyJunk crews to start the demo and building cleanout. Often times our junk removal crews are working on many commercial office cleanouts downtown after 6:00 PM when the building is near empty of the days workers. This time a whole section of the apartment building is under renovation and our crews were able to begin first thing in the morning. If you got junk and are looking for a building cleanout, office cleanout, office furniture removal, property cleanout or a house cleanout give the pros at PhillyJunk a call. PhillyJunk is a commercial and residential junk removal company serving Philadelphia, Chester County, Delaware County, Bucks County, Montgomery County, Southern New Jersey and northern Delaware. 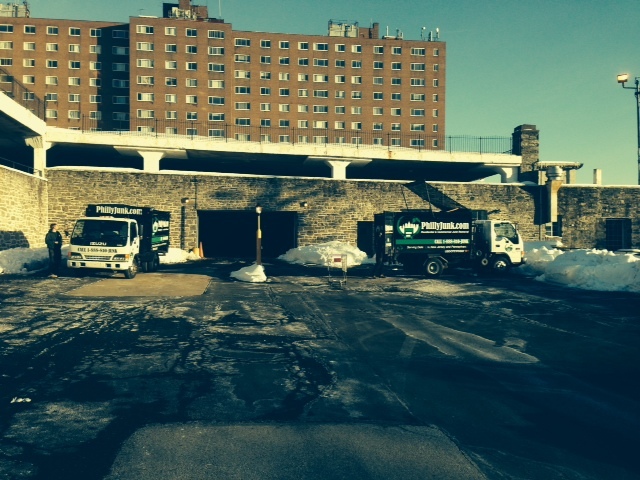 We specialize in large commercial property cleanouts.